Long-term weather forecasters are predicting one of the coldest ever winters for the UK this year, with dire predictions of deep snow and prolonged frosts. Many claim it will be worse than December 2010, when the UK experienced 23 days with an air frost and an average temperature of -0.9°C and an extreme average minimum of -4.1°C - over five degrees below the norm. And if you look at trends for the past five years, the temperature has indeed been above average only once. However, the chilling trend is a more recent phenomenon; in the first seven years of the 2000s the December temperature was below average only once - in 2001. The average mean temperature for December from 2002 to 2007was over 4.9°C, but has averaged 2.75°C since then. Winter 2010 was certainly extreme - with the heaviest and most extensive early snowfall for 45 years. But it was not unprecedented; with similar periods of snow cover recorded the previous year, from late December 2009 into January 2010. Table 1:DecemberUK average weather highs and lows - UK average temperature, rainfall and sunshine hours. 2012 continued the trend for colder winters with more frosts, and was the wettest for the past decade; with 50% more than norm and rain on an average 20 days of the month. The prospect of snow cover significantly increases the risk of Microdochium (Fusarium) Patch. Although air temperatures may be cold, the snow acts as a thermal blanket at soil level and creates permanently moist leaf conditions, where the disease pathogen can thrive. 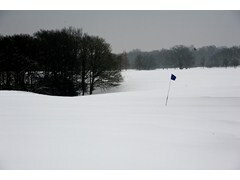 Experiences in 2010 highlighted that when the snow thawed, turf without fungicide protection had been seriously hit. Turf managers who had applied Medallion TL ahead of forecast snow cover and predicted high disease risk conditions, however, reported very good results and turf remaining disease free. Early reports indicate that, after the wet autumn, there is a high incidence of Microdochium inoculum present on the leaf and in the thatch in many turf surfaces, which is expected to increase as conditions turn more conducive. Applications of Medallion TL can reduce the pathogen loading, and help to deliver long-term protection for the turf leaf. Assessing this season's on-going risks, using the GreenCast five-day disease forecasts to proactively target application timing, can help to prevent disease affecting turf quality early in the winter, when there is little opportunity for recovery right through until the spring. Where it is possible to foresee periods of disease risk there is potential to get the best protection from proactive applications of Medallion TL, applied as close as possible to the infection period and targeted to reduce turf pathogens on the leaf, thatch and soil. In variable weather conditions, or if applications have been delayed, the multi-active Instrata offers greater flexibility. GreenCast weather and disease historic records have also proven a persuasive tool to help greenkeepers and groundsmen to justify and explain their management regimes to greens committees and managers.